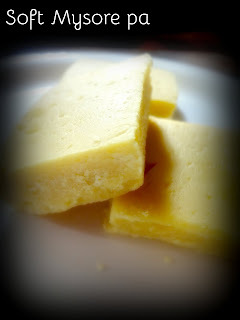 I have always wanted to try the famed Sri Krishna style Mysore pa which is practically oozing with ghee and very sweet . Just one piece is enough to give a melting rich sweet taste which lingers for long. While the amounts of ghee, oil and sugar has been slightly reduced as I do not have the courage to use the increased amounts required, I must admit the outcome was good and judged in the house with flying colours. But I doubt I will make it as often as I would love too ! But festivals are a yearly thing so one must conform to the recipe. I also find making this kind of soft Mysore pa is more easier than the usual semi porous hard Mysore pak, so I think this is great for beginners to try . A tiny Pinch of turmeric powder ( optional ) to get the pale yellow Mysorepa. 1. First mix the gram flour with a little hot ghee around 1 tbsp and roast for 3 minutes till a delicious aroma emanates but don’t burn . 2. Sieve the ghee coated roasted flour well to remove the lumps. Dont skip this step. Keep the sieved besan flour aside . Keep a greased plate or tin ready. Dont do it at the end as you will have no time to do that . 3. Prepare the sugar syrup in a very heavy bottomed non stick pan with ½ cup water just about enough to cover the sugar. 4. At the same time in the other gas burner, keep the ghee oil mixture in another pan to heat well, and keep the flame on low as the oil must remain very hot till the whole process is over. Dont miss this step also. 5. When the sugar syrup is getting ready,take 1 cup of hot ghee oil mixture and add all the roasted sieved flour in it, mix well with a whisk and it will look like a pasty thick batter , keep to rest for few minutes while the sugar syrup is getting ready.Do not keep on heat yet. Keep the remaining 1/4 cup ghee oil mixture hot and ready to be poured at the time of mixing mixture in the sugar syrup. Test sugar syrup it for one string consistency, it will keep bubbling, take a drop and test in water by dropping to check for a smooth ball consistency. It should mould itself into a smooth ball and not disintegrate. Another way is to take a drop of hot syrup with one finger and thumb and see whether the string forms and it is sticky. 6. Now add the thick ghee oil besan mixture which you have made . Keep the flame on low and keep adding the lava like mixture slowly into the hot bubbling syrup while stirring briskly in round circular movements and adding the remaining ¼ cup ghee oil mixture . Dont leave the round stirring circular movement and , do not increase the flame too. Soon the mixture will start leaving the sides, appearing thick and forming a shiny mass coming together like a ball, now this is the time to pour the thick shiny mixture into the greased plate or tin and no need to pat it smooth. Allow the soft mixture to spread itself all over the plate and settle. When it is almost warm , make the slice marks with a knife. That’s it!! Your soft Mysore pa Sri Krishna style is ready to be devoured. It is a good idea to allow it to cool naturally completely before you attempt to break away the slices. 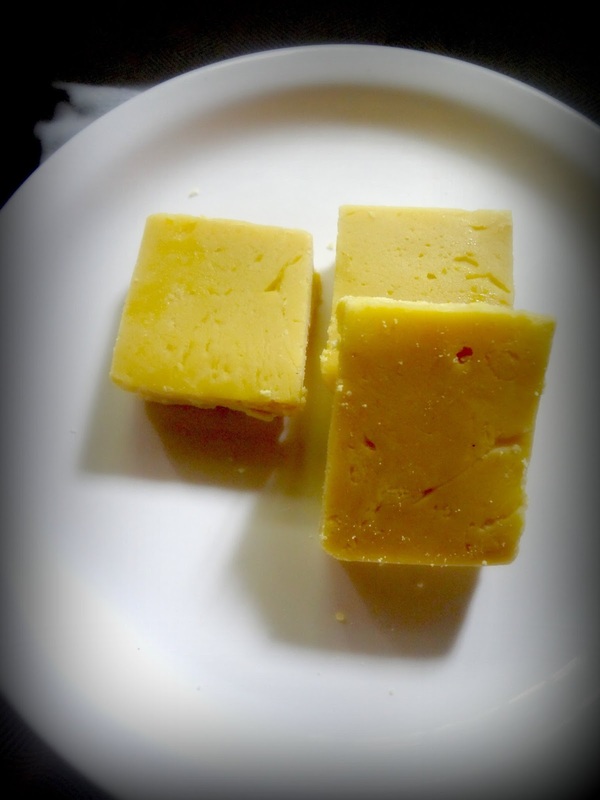 The prepared besan oil ghee mixture has been added to the hot boiling sugar syrup slowly while whisking continuously. I upturned the plate of Mysorepa after it cooled down, for easy removal of the pieces, it comes out easily as there is so much oil ghee in it! As the quantity I made was enough for half a plate only you see the semi circle.Choose a suitable depth and size plate or tin if you want perfect pieces. You must sieve the ghee mixed roasted gram flour to remove the small balls of lumps to avoid making lumpy Mysore paak. While the sugar syrup is getting ready , the ghee oil mixture to remain hot in the other gas burner either on a low heat or in a vessel of very hot water by placing the steel oil container in the vessel of hot water.. The few seconds while you are stirring the hot gram flour, sugar syrup and the pouring of hot oil on the mixture is going , ignore all interruptions, door bells, or phone calls. This is the vital few seconds that will determine the perfect making of a soft Mysore Pa or you will end up with a flaky hard one .